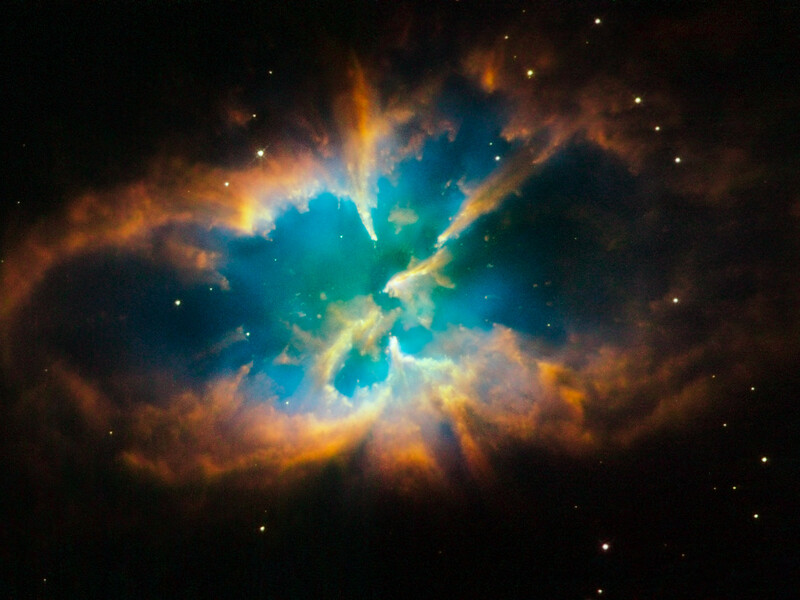 The unique planetary nebula NGC 2818 is nested inside the open star cluster NGC 2818A. Both the cluster and the nebula reside over 10 000 light-years away, in the southern constellation Pyxis (the Compass). NGC 2818 is one of very few planetary nebulae in our galaxy located within an open cluster. Open clusters, in general, are loosely bound and they disperse over hundreds of millions of years. 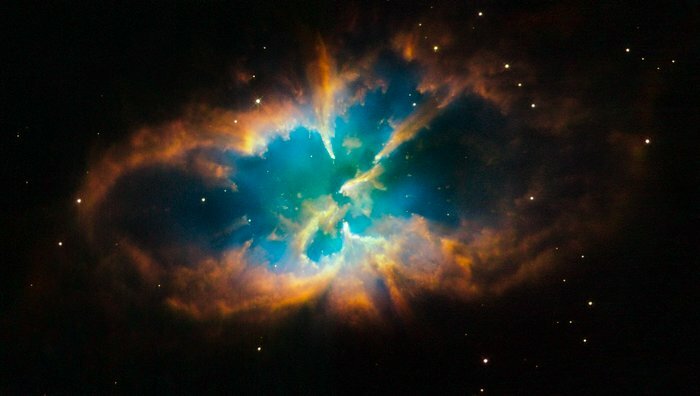 Stars that form planetary nebulae typically live for billions of years. Hence, it is rare that an open cluster survives long enough for one of its members to form a planetary nebula. This open cluster is particularly ancient, estimated to be nearly one billion years old. The spectacular structure of NGC 2818 (also known as PLN 261+8.1) contains the outer layers of a sun-like star that were sent off into interstellar space during the star' s final stages of life. These glowing gaseous shrouds were shed by the star after it ran out of fuel to sustain the nuclear reactions in its core. Planetary nebulae fade away gradually over tens of thousands of years. The hot, remnant stellar core of NGC 2818 will eventually cool off for billions of years as a white dwarf. Our own Sun will undergo a similar process, but not for another 5 billion years or so. This Hubble image was taken in November 2008 with the Wide Field Planetary Camera 2. The colours in the image represent a range of emissions coming from the clouds of the nebula: red represents nitrogen, green represents hydrogen, and blue represents oxygen. Position (Dec): -36° 37' 39.17"